The non-profit, international organization Council on Tall Buildings and Urban Habitat (CTBUH) was formed in 1969 and announces the title of “The Worlds Tallest Building” and sets the standards by which buildings are measured. It maintains a list of the 100 tallest completed buildings in the world. The council currently ranks Burj Khalifa as the tallest at 828 m (2,717 ft).The CTBUH only recognizes buildings that are complete, however, and some buildings listed within these list articles are not considered complete by the CTBUH. Below is a detailed list of the 10 tallest buildings in the world. Before we begin listing the 10 tallest skyscrapers individually we will show all 10 skyscrapers on a line graph(click image below to enlarge). Burj Khalifa known as Burj Dubai prior to its inauguration, is a skyscraper in Dubai, United Arab Emirates, and is currently the tallest structure in the world, at 828 m (2,717 ft). Construction began on 21 September 2004, with the exterior of the structure completed on 1 October 2009. The building officially opened on 4 January 2010, and is part of the new 2 km2 (490-acre) flagship development called Downtown Dubai at the ‘First Interchange’ along Sheikh Zayed Road, near Dubai’s main business district. The tower’s architecture and engineering were performed by Skidmore, Owings and Merrill of Chicago, with Adrian Smith as chief architect, and Bill Baker as chief structural engineer. The primary contractor was Samsung C&T of South Korea.The total cost for the project was about US$1.5 billion; and for the entire “Downtown Dubai” development, US$20 billion.\In March 2009, Mohamed Ali Alabbar, chairman of the project’s developer, Emaar Properties, said office space pricing at Burj Khalifa reached US$4,000 per sq ft (over US$43,000 per m²) and the Armani Residences, also in Burj Khalifa, sold for US$3,500 per sq ft (over US$37,500 per m²). Taipei 101 , formerly known as the Taipei World Financial Center, is a landmark skyscraper located in Xinyi District, Taipei, Taiwan. The building ranked officially as the world’s tallest from 2004 until the opening of the Burj Khalifa in Dubai in 2010. In July 2011, the building was awarded LEED Platinum certification, the highest award in the Leadership in Energy and Environmental Design (LEED) rating system and became the tallest LEED building in the world. Taipei 101 was designed by C.Y. Lee & partners and constructed primarily by KTRT Joint Venture. The tower has served as an icon of modern Taiwan ever since its opening, and received the 2004 Emporis Skyscraper Award. Fireworks launched from Taipei 101 feature prominently in international New Year’s Eve broadcasts and the structure appears frequently in travel literature and international media.Taipei 101 comprises 101 floors above ground and 5 floors underground. The building was architecturally created as a symbol of the evolution of technology and Asian tradition (see Symbolism). Its postmodernist approach to style incorporates traditional design elements and gives them modern treatments. The tower is designed to withstand typhoons and earthquakes. A multi-level shopping mall adjoining the tower houses hundreds of fashionable stores, restaurants and clubs. The Shanghai World Financial Center is a supertall skyscraper in Pudong, Shanghai, China, developed by Mori Building. It was designed by Kohn Pedersen Fox. It is a mixed use skyscraper which consists of offices, hotels, conference rooms, observation decks, and shopping malls on the ground floors. Park Hyatt Shanghai is the hotel component containing 174 rooms and suites. Occupying the 79th to the 93rd floors, it is the second highest hotel in the world, surpassing the Grand Hyatt Shanghai on the 53rd to 87th floors of the neighboring Jin Mao Tower. On 14 September 2007 the skyscraper was topped out at 492.0 meters (1,614.2 ft) and became the second-tallest building in the world; as well as the tallest structure in the People’s Republic of China, including Hong Kong. It also had the highest occupied floor and the highest height to roof, two categories used to determine the title of “The World’s Tallest Building”. The International Commerce Centre is a 108 floor, 484 m (1,588 ft) skyscraper completed in 2010 in West Kowloon, Hong Kong. It is a part of the Union Square project built on top of Kowloon Station. The development is owned and jointly developed by MTR Corporation Limited and Sun Hung Kai Properties, Hong Kong’s metro operator and largest property developer respectively. It is currently the world’s fourth tallest building as well as the tallest building in Hong Kong. Its formal development name is Union Square Phase 7 and the name International Commerce Centre was officially announced in 2005. International Commerce Centre was completed in phases from 2007 to 2010. The tower opened in 2011, with the Ritz-Carlton opening in late March and the observatory in early April.Sun Hung Kai Properties also developed, along with another major Hong Kong developer, Henderson Land, the second-tallest skyscraper in Hong Kong, the 2 International Finance Centre, which is located directly across Victoria Harbour in Central, Hong Kong Island. The Petronas Towers are skyscrapers and twin towers in Kuala Lumpur, Malaysia. According to the CTBUH’s official definition and ranking, they were the tallest buildings in the world from 1998 to 2004 until surpassed by Taipei 101, but remain the tallest twin buildings in the world. The building is the landmark of Kuala Lumpur with nearby Kuala Lumpur Tower. The Petronas Towers were the tallest buildings in the world for six years, until Taipei 101 was completed in 2004. The height of the towers is measured to the top of their structural components such as spires, but do not include antennas. Spires are considered actual integral parts of the architectural design of buildings, to which changes would substantially change the appearance and design of the building, whereas antennas may be added or removed without such consequences. The Petronas Towers still remain the tallest twin buildings in the world.The Petronas Towers and the Kuala Lumpur Tower dominate the skyline of Kuala Lumpur’s Central Business District.The Petronas’s height compared to some other well-known tall structures Willis Tower (formerly Sears Tower) and the World Trade Center towers were each constructed with 110 occupied floors – 22 more than the 88 floors of the Petronas Towers. Willis Tower’s tallest antenna is 247.4 ft taller than those of the Petronas Towers, however, in accordance to CTBUH regulations and guidelines, the antennas of Willis Tower were not counted as part of its architectural features. The spires on the Petronas Towers are included in the height since they are not antenna masts. Therefore, the Petronas Towers exceed the official height of Willis Tower by 10 m.
The Nanjing Greenland Financial Center supertall skyscraper completed in April 2010 in Nanjing, China. The 89-story building comprises retail and office space in the lower section, and restaurants, a hotel, and a public observatory near the top. The tower’s stepping is functional, helping separate these sections. The mixed-use tower, which overlooks Xuanwu Lake, became the second tallest building in China and the 5th tallest building in the world when topped out in 2008. An observation deck on the 72nd floor, 287 m (942 ft) above ground, provides an unobstructed, panoramic view of Nanjing and the nearby Yangtze River, two lakes and the Ningzheng Ridge mountains. Architectual firm Skidmore, Owings and Merrill designed the building led by Adrian Smith . The Willis Tower (formerly named, and still commonly referred to as the Sears Tower) is a 108-story, 1451-foot (442 m) skyscraper in Chicago, Illinois. At the time of its completion in 1973, it was the tallest building in the world, surpassing the World Trade Center towers in New York, and it held this rank for nearly 25 years. The Willis Tower is the tallest building in the United States and the fifth-tallest freestanding structure in the world, as well as the fifth tallest building in the world to the roof. Although Sears’ naming rights expired in 2003, the building continued to be called the Sears Tower for several years. In March 2009 London-based insurance broker Willis Group Holdings, agreed to lease a portion of the building and obtained the building’s naming rights. On July 16, 2009, the building was officially renamed the Willis Tower. Guangzhou International Finance Centre or Guangzhou West Tower is a 103 story, 440.2 m (1,444 ft) tall skyscraper at Zhujiang Avenue West in Tianhe District at Guangzhou, China.The building was topped out at the end of 2008. Construction of the building, designed by Wilkinson Eyre, broke ground in December 2005. When complete, the building will be used as a conference centre, hotel and office building. Floors 1 to 66 are used as office, floors 67 to 68 are mechanical equipment, floors 69 to 98 as a Four Seasons Hotel and in floors 99 and 100 is an observation deck. The hotel lobby is located on the 70th floor. The building was completed in 2010. The building was previously known as Guangzhou West Tower and had a related project, the proposed Guangzhou East Tower which, at 475 m (1,558 ft), would have been even taller, though that project has been awarded to a different design by Kohn Pedersen Fox, the 530 m (1,740 ft) tall Chow Tai Fook Centre. The Trump International Hotel and Tower, also known as Trump Tower Chicago and locally as the Trump Tower, is a skyscraper condo-hotel in downtown Chicago, Illinois. The building, named after real estate developer Donald Trump, was designed by architect Adrian Smith of Skidmore, Owings and Merrill. Bovis Lend Lease built the 98-story structure, which reached a height of 1,389 feet (423 m) including its spire, its roof topping out at 1,170 feet (360 m). It is adjacent to the main branch of the Chicago River, with a view of the entry to Lake Michigan beyond a series of bridges over the river. The building received publicity when the winner of the first season of The Apprentice television show, Bill Rancic, chose to manage the construction of the tower. Trump announced in 2001 that the skyscraper would become the tallest building in the world, but after the September 11, 2001 attacks, the building plans were scaled back, and its design underwent several revisions. When topped out in 2009 it became the second-tallest building in the United States after Chicago’s Willis Tower (formerly known as the Sears Tower). It is expected to be surpassed by One World Trade Center in New York City in the middle of 2013. 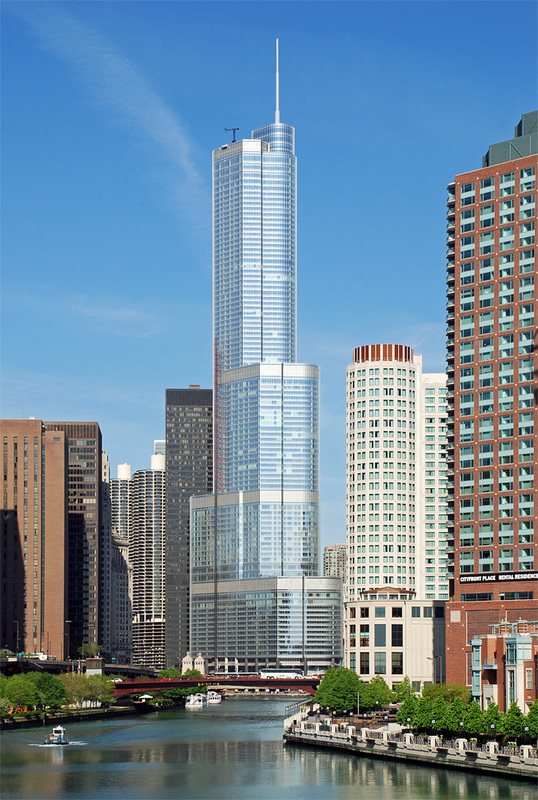 Trump Tower surpassed Chicago’s John Hancock Center as the building with the world’s highest residence above ground-level and held this title until the completion of the Burj Khalifa. As of 2011 it is the tenth-tallest building in the world. 11 Comments on "10 Tallest Buildings In The World 2013"
Mr. Junk.. Sorry Chuck, I own 100 apartment complex each of 3 storage, when combined together it would be taller than any of the buildings in the world…. What do you say? Hey you missed the CN Tower! It used to be the tallest before the Burj Khalifah! Hey , you have missed mecca clock tower which is the second coompleted largest building in the world locate in suadia arabia….!! thats mean Petronas Tower is the tallest twin building ?